♥ Hone your marriage direction. ♥ Test your decisions using your values. Your values build who you are. Each of us have a set of values we use to navigate through our life. There are Godly, core, fundamental values such as: love, joy, peace, patience, kindness, goodness, faithfulness, gentleness, and self control. As Christians we all strive to have these values. But there’s the key – we ALL strive to work toward these values (and other Christ-like virtues). These are good and necessary. We use them as a compass. What can you use to identify and differentiate you and your spouse from other Christian couples in leadership? What can you use to make decisions for your unique purpose? How do you build your differentiation? 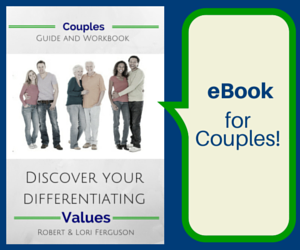 Using a set of 400+ values – corralled into 15 categories – you and your spouse have the opportunity to discover the values that will differentiate the two of you. These 3 value words will encapsulate your uniqueness. How can you know which 3 values are your differentiating values? Values are a signpost, a way for decision making to be easier. Posts on leadership influence in your marriage, family, business, and as a volunteer at church or in a non-profit. Leading into 2017 – What’s your focus?